Our first stop was at the head of Gudvangen Fjord where we took pictures of replica Viking boats and men pretending to be Vikings. I would have liked a bit more time to escape and simply sit quietly, absorbing the beauty of the scenery but we had to get on. Then it was a leisurely drive through the Naeroy Valley, a UNESCO World Heritage site, bedecked with spring flowers and mountains newly covered in snow. Everywhere you look there are waterfalls, streams and tumbling rivers that would delight the heart of the most ardent white-water kayaker. Passing through numerous tunnels, our guide explained that they had mostly been made in the past 20 years and have greatly improved the infrastructure of this mountainous country. 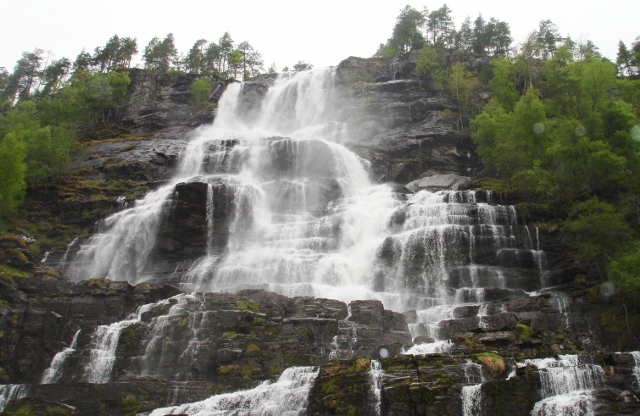 The excruciating bends of the Stalheimskleivane, the steepest road in Norway, were negotiated with slow precision and then we were at the lovely Tvinde Waterfall. Having been told that the waters have rejuvenating powers, many of us took a few icy gulps on the off-chance. Then it was on past the quaint village of Gudvangen to the rather unprepossessing town of Voss, badly bombed during the war, but with a pretty old church and lovely lakeside views. 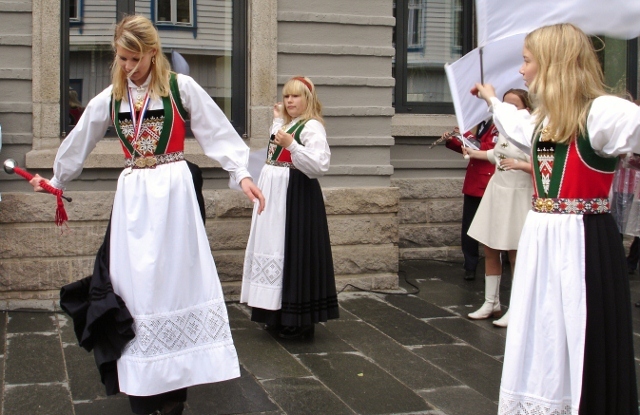 Following the sound of a brass band, we found a little procession of young women in traditional dress, performing a dance for some local dignitaries. These unexpected glimpses into a country’s traditions are one of the many things I love about travel. 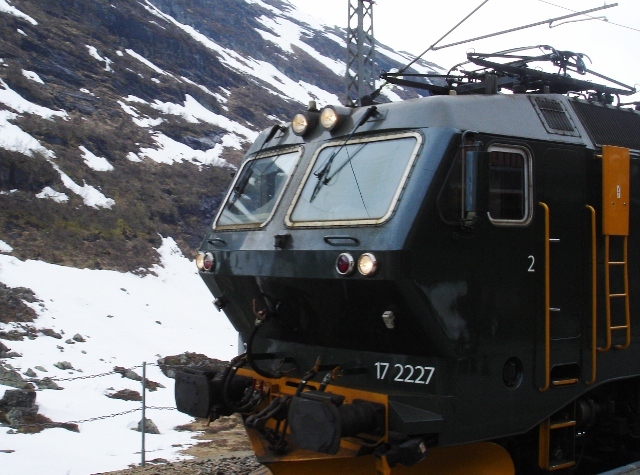 After a rather good lunch (great salmon & other fish in Norway) we went to the station to catch a train from Voss to Myrdal, 2,845 ft above sea-level, for our connection with the Flåmenbaum train. This ‘adhesion-type railway’ (no idea!) travels slowly down the vertiginous mountain-side at a gradient of 80% – VERY steep. We got out in one of the 20 tunnels to look at Kjosfoss Waterfall – another surging torrent of water, the beauty of which no photo can replicate. 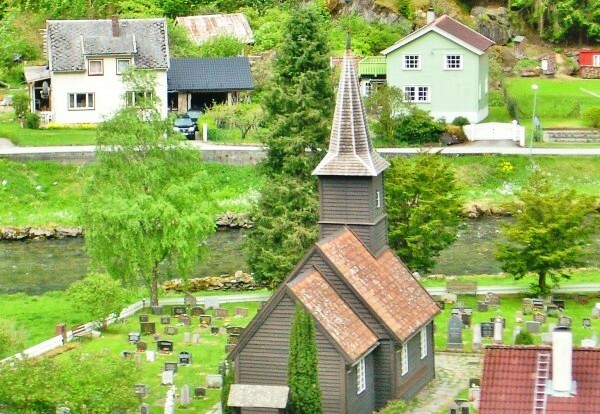 Returning through the tiny village of Flam the wooden church looked like a toy from a child’s farm set. The scenery on this train journey is beyond superlatives; it rightly stands as one of the most spectacular train rides in the world. Back in Flåm there was only time for a couple of quick photos before we had to return to our ship. 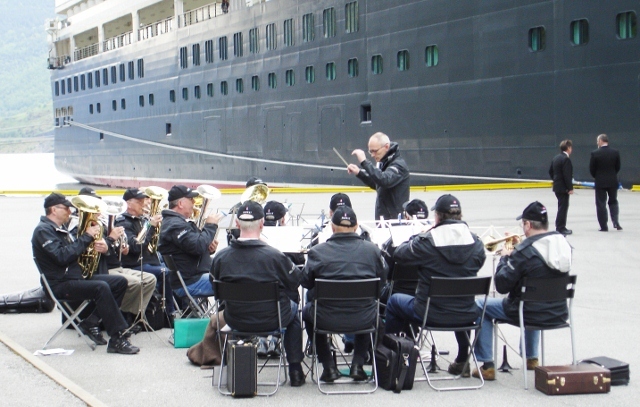 A little brass band was seated on the quayside playing merrily as we embarked. Walking up the gangway, with its banner proudly declaring ‘Queen Elizabeth‘, I was happy to back on board after a yet another truly memorable day out in marvellous Norway. 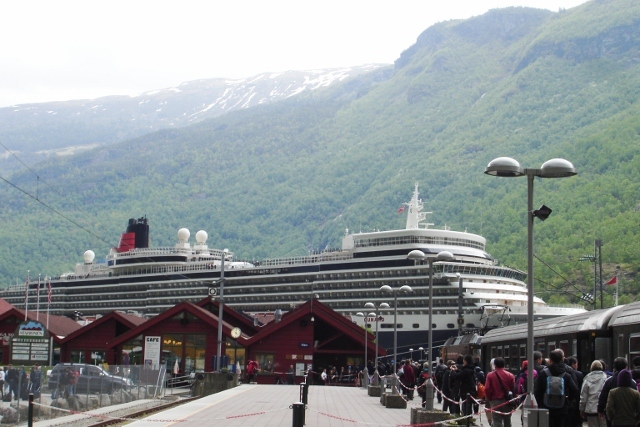 Many thanks to Cunard for a great Norway cruise experience – Sognefjord and Flam are highly recommended! I enjoyed reading your blog Zoe – I was also on this trip – another most memorable trip on Cunard – the only way to go! Sounds fun! But I think I’d be annoyed if the ship was delayed while we were waiting on some late arrivers. If they’re more than 30 minutes late, I say, leave them behind! Scott – the ship does sail if you go ashore independently and are late! If you book one of the ship’s tours then the captain won’t go without you – hence a lot of passengers opt for those trips. 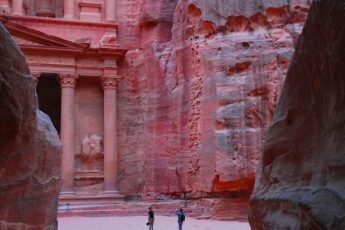 As I am usually a very independent traveller I found it rather strange to be on a tour and not able to take my time whenever I wanted to look around, but can see it would suit a lot of people. Hi Fiona – I guess you must be one of the regulars 🙂 I was most impressed by how many passengers were returning cruisers – I can see how it could become addictive. As a cruise virgin it certainly enabled me to see the huge appeal it can have. I would have liked a couple more ‘sea’ days to make the most of all the great facilities on board, or simply curl up with a good book in one of the many cosy corners! it looks so beautiful. i love the band! I’m hoping one of my future ship will take me there!! Lovely views – I am, of course, referring to the stunning scenery, not the nice ladies in national dress. John – I hope you got the email I sent in reply to yours answering your issue. The dates on blog posts indicate the date published rather than the date the place was visited. Cunard took the articles from this website and therefore the dates were as I had written them. It was not meant to misrepresent the trip and Cunard certainly knew when they had visited the area. I found their attention to detail was first-class and being American-owned has undoubtedly enabled Cunard to continue cruising. However, I appreciate everyone experiences their journey in different ways and am sorry that the dates caused you concern. Extracts from this blog appear in “The Cunarder” magazine issued August 2011 where it would appear that Flam was visited on 25th May. You will recall we were there on Sunday 22nd May. The same issue occurs on all the extracts published! One would think Cunard would know when The QE was there. Attention to detail is a forgotten skill, particularly with this American owned company. My husband and I were also on this beautiful trip (and ship) and would recommend it to anyone. We are planning the New England and Canadian Sojourn cruise at the end of this month on The QM2 and really looking forward to it. We just love to cruise. Have you visited New England I would love to hear from you with any suggestions. Wasn’t it a lovely trip 🙂 I have never been to New England and would love to go. Have a fab time when you go! Zoe, I’ve read your previous Norwegian cruise posts which gives a very good overview of this cruise. I have to say you’ve tempted to go on this cruise – not just to enjoy the remarkable scenery but I also like the irony of “invading” the Viking nation from the sea. How did you find the costs of things on land and on sea? There are some really good deals to be had on the Cunard cruises and this one is particularly good value. The captain said it was one of his favourites – you get REALLY close to the fjords and the ships is such a majestic way to visit. It converted me to cruising – and the Cunard way of travel! Thanks Zoe, I’ll pack my own jumpers!